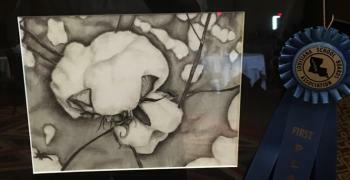 Congratulations to Abigail Rinaudo whose artwork was awarded First Place in the Annual Louisiana School Boards Association contest. Abigail is a freshman at Ouachita Parish High School. Her art piece was completed as an eighth grade student at East Ouachita Middle School. The artwork will now hang in the LSBA offices of Baton Rouge for the next year. Abigail’s art teachers (pictured) are Jennifer Sweeney and Anne Gilbert.